Within my studio, which has a welcoming, relaxed atmosphere, I have my own made to measure collection of bridal gowns which are available to buy or to be used as inspiration to create a bespoke gown. In my collection I have separates which can be teamed together to give different looks and to suit all figures. 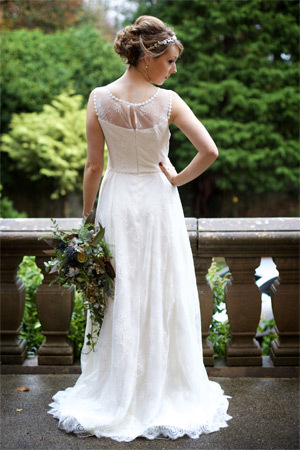 Brides- to- be, therefore have a choice to pick a design from my collection or go for the full bespoke gown. 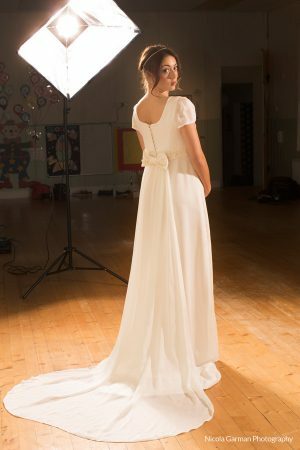 If you choose the bespoke option it allows you to create the style of gown you had imagined but cannot find anywhere, or if you like the style of my gowns you could have it made in a different fabric, colour or change the style such as changing neckline shape or add more beading detail. In other words have a gown customised to your requirements. To have a made to measure gown completed an ideal lead time would be six months but it may be possible to work to a shorter deadline. Gowns from my made to measure collection start from £750.00. Bespoke dresses start from £900.00. Bridesmaid’s dresses start from £200.00. These prices are only a guide as each dress is individual and can be costed in silk or man-made options. Please contact me for fully accurate cost. Sample gowns are for sale from time to time to make space for new designs so please have a look at my what’s on page to see what is available.